This year’s Most Improved Player is easily Indiana Pacers’ guard, Victor Oladipo. It’s been quite the journey in the NBA for Oladipo, who’s now on his 3rd team in just his 5th season in the league. Before this season his averages were just 15.9 points, 4.4 rebounds, and 3.7 assists per game. In the summer of 2016, he was traded from the Magic to the Thunder in an effort to give Russell Westbrook a decent sidekick. That didn’t work out, as Oladipo had his worst statistical season since his rookie year. This past summer, Oladipo was traded again in another effort to bring Westbrook some help. Only this time he found himself on the other end of the deal. Oklahoma City sent Oladipo on his way to Indiana for the acquisition of Indiana’s All-Star Forward, Paul George. Looks like Oladipo just needed to go back to the state where he played in college to get back to his All-American form. This season the 6’4” shooting guard earned his first All-Star appearance as he put up career highs in points, rebounds, assists, and steals; Those stats being 23.1, 5.2, 4.3 and 2.4 respectively. 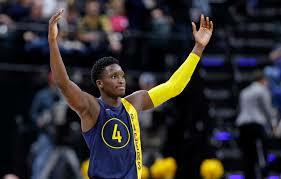 Oladipo was definitely the difference maker for the Pacers, leading the team to a 48-34 record and the 5th seed in the Eastern Conference. This wasn’t a bad result for a team that was expected to be lucky to get into the playoffs after trading away their best player. Turns out, Victor Oladipo might be even better for the Pacers than Paul George. The team’s 48 wins this season were 6 higher than last year when they were led by George. After failing to live up to expectations early in his career, it looks like Oladipo has a bright future ahead of him. My guess is this season’s All-Star appearance won’t be the last for this year’s Most Improved Player.